The Boise River is a 102-mile-long (164 km)tributary of the Snake River in the northwestern United States. 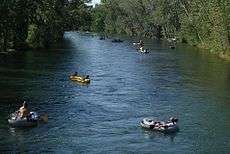 It drains a rugged portion of the Sawtooth Range in southwestern Idaho northeast of Boise, as well as part of the western Snake River Plain. The watershed encompasses approximately 4,100 square miles (11,000 km2) of highly diverse habitats, including alpine canyons, forest, rangeland, agricultural lands, and urban areas. The Boise River rises in three separate forks in the Sawtooth Range at elevations exceeding 10,000 feet (3,050 m), and is formed by the confluence of its North and Middle forks. The North Fork, 50 miles (80 km) long, rises in the Sawtooth Wilderness Area, along the Boise-Elmore county line, 60 miles (100 km) northeast of Boise. It flows generally southwest through the remote mountains in the Boise National Forest. The Middle Fork, approximately 52 miles (84 km) in length, rises within 12 miles (19 km) of the North Fork in the southern Sawtooth Wilderness Area in northeastern Elmore County. It flows west-southwest near the town of Atlanta, joining the North Fork to form the Boise River, approximately 15 miles (24 km) southeast of Idaho City. The main stream flows southwest into Arrowrock Reservoir joining the South Fork from the Anderson Ranch Dam. 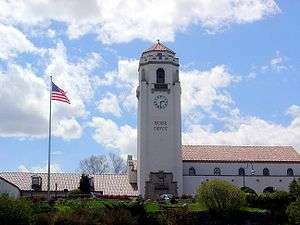 The Boise Union Pacific Depot is a former train station in Boise, Idaho, United States. It was built in 1925 by the Union Pacific Railroad. In 1990 MK-Morrison Knudsen purchased the depot and renovated it to pristine condition. 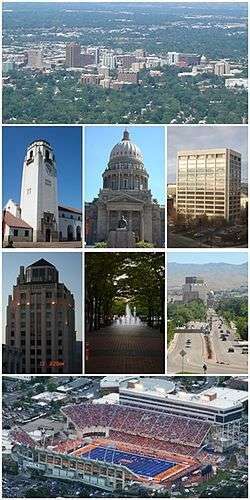 In 1996, the City of Boise took it over and opened it for tours and special events. It is open to the public on Sunday and Monday from 11:00 am to 5:00 pm. Following the construction of the depot, service by Union Pacific's Portland Rose began with service between Chicago, Illinois and Portland, Oregon. Union Pacific discontinued the Portland Rose (along with all its passenger rail service) on 1 May 1971, the day Amtrak began operating. Amtrak (the National Railroad Passenger Corporation) began service to the station in 1977 with the Pioneer, which originally provided service between Salt Lake City, Utah and Seattle, Washington, but was eventually extended further east and provided daily service from Chicago, Illinois to Seattle. Originally the next eastbound stop on the Pioneer was in Mountain Home, but that station was dropped as a stop in 1981, so the next eastbound stop was in Shoshone. 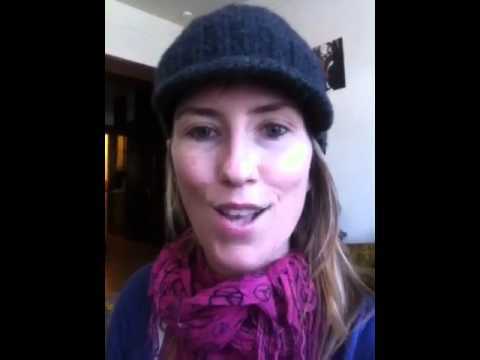 The next westbound stop was in Nampa.